Home » Best Practices » When is too early? First off, you have to change your perspective on “what golf is” to a young child. For them, golf is not about hitting golf balls or playing holes… it is about spending some “fun time” with their parent or family member. I often say that going to the golf course is like a long conversation with your child, where hitting golf balls gets in the way (much like fishing). 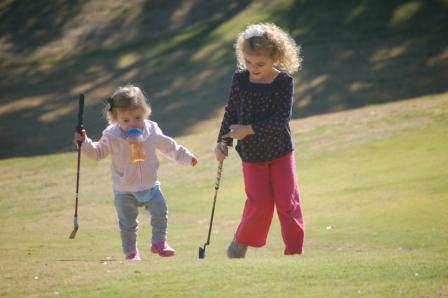 Some of my most enjoyable times with my girls is not hitting golf… but just having fun together on the golf course. If you want to take your child to the course… the main thing is to just go out there and let them spend time with you… even if they don’t even want to pick up a club… this is ok. Don’t force it! For those of you looking to take your young’ in out to the golf course, here are a few activities you can engage in… both in hitting balls and other fun non-golf activities. Age 0-1 – Sit them on the putting green by the hole and let them crawl around play with balls on the green and/or in the hole. 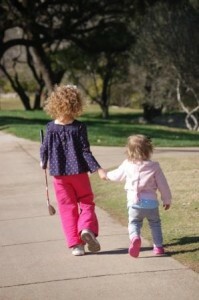 Age 1-3 – Give them a putter and put the ball an inch away from the hole… and help them knock it in. When they do… a very important key action is for you to celebrate when they hit the ball…watching them smile and get excited will make your day. Age 3-5 – Play games, play games, play games. Everything you do needs to be structured as a game. A few suggestions: hit balls into the water, clip the tee game, or the longest putt game. A key suggestion to peak their interest is to let them make up the game… this will get them more engaged in the activity. A final rule of thumb that will be applicable to anything you do while on your golfing adventure… pay close attention to their attention span. Once you see them fade… move onto another activity (don’t press it). Something’s they will want to continue for 15 min… while others for 30 seconds. Now here is somebody that knows what they are talking about!! There are also scientific aspect attached to golf and if we learn more about them, we will perform better on the putting green and on the course. Kids are the most voracious learners in the game. You tell them something they say, ‘Oh, okay’ and they start doing it that way. Swinging a golf club, walking the course, proper bending and stretching before and after the round all translate into great health benefits without hurting kids physically as may be the case with other sports.
. Findmygolfbuddy.com provides you excellent opportunity to play a round of golf for fun. They provide you with compatible golf partners to play round of golf so that can enjoy the game of golf more. you are so correct… find my golf buddy sounds like a great service for connecting golfers. Especially for kids (girls)… if they have a friend they can play with… it doubles the fun… best of luck.